Posted on 11th February 2019 at 9:57 am. We’ve covered pretty much everything there is to know about artificial grass for dogs in previous articles, such as ‘How to Choose the Best Fake Grass for Your Dog’, ‘6 Reasons Why Dog Owners Should Consider Having an Artificial Lawn’ and ‘Artificial Grass for Dogs – Everything You Need to Know’. But we also get a large number of questions regarding artificial grass and cats. So, we thought we would put together an article that includes all of the frequently asked questions we get on the subject of fake grass and cats. Pet owners are turning to synthetic turf to transform their gardens for many reasons. The problem with real grass and pets is that they just don’t mix too well. Most dogs and cats love to dig, which of course can be fun for them, but frustrating for their owners, whose lawns are on the receiving end. And, of course, dogs and cats will be urinating on your grass, too. Urine has a knack of killing grass, leaving ugly yellow, patchy turf that can completely ruin the look of your entire garden. They can also play on fake turf all year round without getting dirty, which does away with the problem of muddy pawprints that get trodden back into the house. Many cats live solely indoors and artificial grass is proving very popular for owners of indoor cats, who are using fake turf to create stimulating environments for their pets to play and exercise in. This, of course, is extremely important for every cat, but perhaps especially for indoor cats, who are likely to get less exercise than their outdoor counterparts. However, before taking the plunge and installing a cat-friendly artificial lawn, you’ve likely got some questions and, fortunately, you’ve come to the right place. Below, we’ve listed the most popular questions and answered all of them in the hope of clearing up any queries you may have. If there is anything we haven’t covered, please leave your question in the comments section at the bottom of this page and we’ll add it to the list, along with our answer. 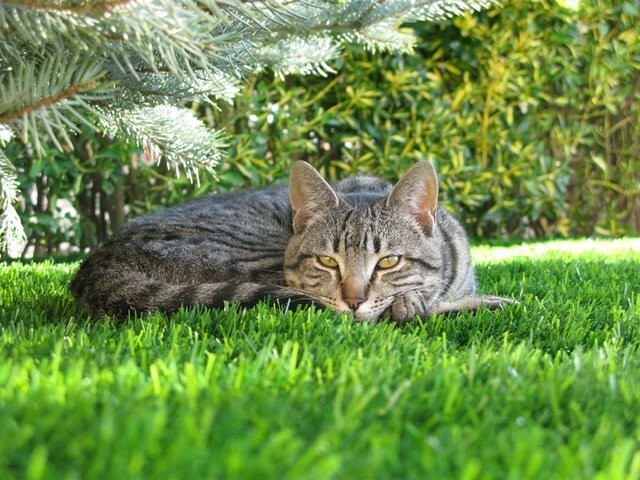 Is artificial grass safe for cats? Yes, it is. You should, however, always check with your chosen manufacturer for independent certification to prove that their products are free from harmful substances. A good certification to check for is the Oeko-Tex Confidence in Textiles, which is awarded to manufacturers whose products have been thoroughly tested and proven to be free from any substances that could cause harm to humans or pets. Pets will happily play on fake grass in exactly the same way they would play on the real thing. In fact, most cats and dogs prefer the lush feel of fake turf, especially if your real grass lawn is dry and patchy. Will my cat be able to eat the fake grass? Once you have your fake lawn installed, your cat may not be able to resist the urge to lick or attempt to chew the plastic fibres of your turf. As mentioned above, if the product is free from harmful substances then you needn’t worry, as it won’t cause them any harm at all. In fact, fake turf is actually less toxic than real grass that has been chemically treated. Will cat pee stain my artificial grass? 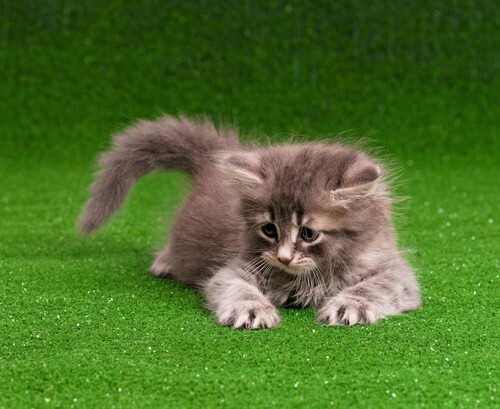 Unlike real grass, urine from your cat will not stain, burn or discolour artificial turf. It is recommended, however, that you regularly rinse urine off your artificial lawn to prevent smells developing and to stop the urine from crystallising. 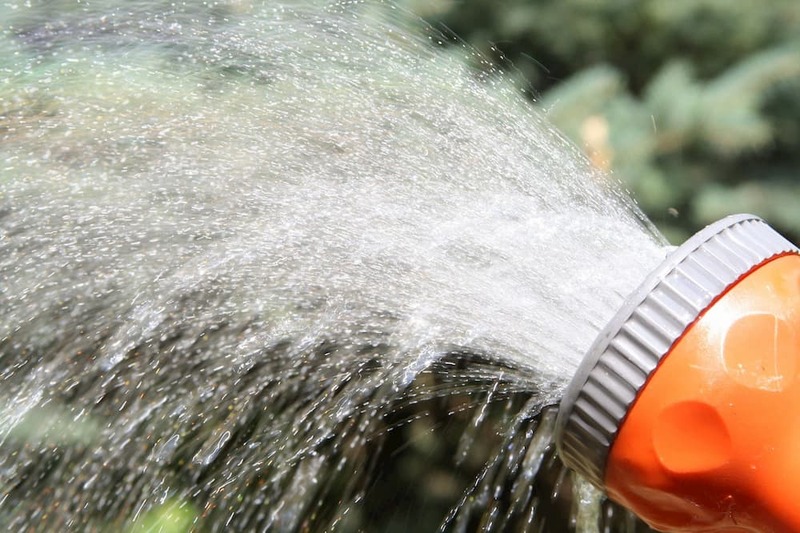 With the amount of rainfall we get throughout the year in the UK, this usually means that it’s only necessary to do this during the summer months or when it hasn’t rained for a couple of weeks. Often, the natural rainfall will do the job for you. Will cat poo stain my artificial lawn? Just as urine will not stain your fake turf, neither will cat poo – although we do recommend that you remove it from your artificial lawn. How do I clean cat poo from my artificial grass? Solid excrement can be removed from the turf in exactly the same way you would remove it from real grass. If necessary, you can use a cloth and warm water to clean the fibres afterwards. My cat likes to sunbathe on our lawn during the summer, will the grass be too hot to lie on? It is true that the synthetic fibres of artificial grass can increase in temperature during hot summer days. To combat this, we pioneered a unique innovation that moderates the temperature of artificial grass and helps to keep it cool. This technology, known as Feelgood® technology, ensures your fake lawn stays up to 12 degrees cooler than standard artificial turf, keeping it comfortable to walk on barefoot during even the hottest summer days. Ensuring that your lawn contains a sand infill will also help to keep your fake lawn cool. If your cat enjoys sunbathing on your garden lawn, always choose a turf with Feelgood technology, such as Aberdeen or Inverness. Is artificial grass suitable for indoor cats? We are often asked by owners of indoor cats whether or not fake turf would be suitable to create an indoor play area. The short answer is yes, and artificial grass for cats is a great way to add another texture to help stimulate your indoor cat. Every cat is different, though, so we would recommend that you get a small sample of artificial grass to see if your cat is comfortable with it, before buying any quantity of artificial grass. We hope that you have found this blog post useful in answering some of the questions you may have regarding artificial grass and cats. To summarise, your cat will take to artificial grass in just the same way as they would the real thing; in fact, they are likely to prefer the lush nature of artificial turf – which is perfect for lazing around on – over patchy, dry real grass. There are, of course, some quick and easy maintenance tasks needed to ensure your fake lawn stays in the best condition. 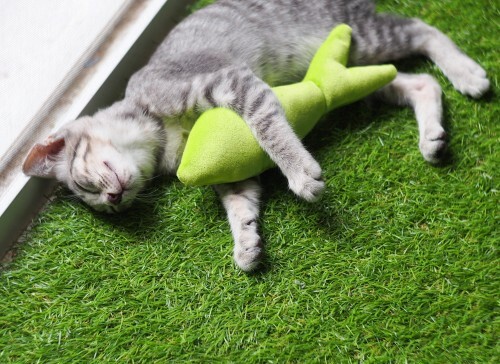 If you have any questions or concerns about buying artificial grass as a cat owner that we haven’t covered in this article, then please leave your questions in the comments section below and we’ll add your question to the list, along with our answer. If you are considering installing artificial grass for your cat, then check out our range of pet-friendly artificial grass. You can also request your free sample pack, by completing the form here. To get a free installation quote from your local NeoGrass Approved Installer, you can search for your nearest installer and contact them directly. Our network of experienced artificial grass installers will gladly visit your property, discuss your requirements and provide you with a free no obligation written quote.